[RUMOR!!] 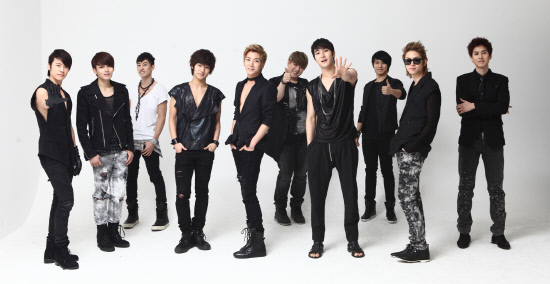 Super Junior’s next track of 2011 to be titled…? Although we’ve heard no official news from SM Entertainment regarding Super Junior’s return to the music stage, a little net browsing by one of allkpop’s readers has revealed some details suggesting a comeback this year with an album. The name GoodWill & MGI may not ring any bells for the average kpop fan, but the American-Finnish producing/songwriting duo makes up the brains behind numerous hit tracks in the United States and Europe. Having opened their official website earlier this month, GoodWill & MGI’s discography page brags an impressive list of successful productions, as well as a section of upcoming songs to be released in 2011. Aside from a line-up of tracks for Justin Bieber (“Latin Girl”), Sean Kingston (“Wake Up the Neighbors,” “GO”), Lazee (“All That She Wants”) plus a collab between Akon, Timbaland & Pitbull (“Boomerang”), the selected discography page also lists Super Junior with a track titled, “Gotcha Numba.” Excited? Interestingly enough, the German artist Jimi Blue is also listed right below Super Junior with a track of the same title, so there is a possibility that the songright was sold to both SM Entertainment and Universal Germany. Remember that none of this information has been confirmed by SME, so stay tuned to allkpop for further details! Many thanks to bopeepjuliette for sending in this tip! This entry was posted on January 29, 2011 by heedina. It was filed under Boy Band, Comeback, News and was tagged with comeback, Super Junior, Super Junior's 5th album.